HONG KONG—Soon after police cleared a major road that activists had occupied in the early hours of Wednesday morning, video began emerging of the violence used to do so. One four minute segment showed a number of officers kicking and stomping on a prone activist, who had already been restrained, in apparent retaliation for splashing police with water. The altercations took place at around 4 a.m., in the police action to take back a key road and tunnel that government employees use to get to work. Police threw students and young activists to the ground. In the case of Ken Tsang—the handcuffed activist whose beating was caught on camera—set upon him when they thought no one was watching. This brought the most direct condemnation of the police so far by protesters, who had previously been somewhat sympathetic to the predicament of the police, caught between the whims of the government and the occupation of key roads by students and supporters. Alan Leong, leader of the Civic Party, said in a press statement that the police action was a “blatant abuse of power.” He said the officers involved should be investigated. “The police must apologize! The police must apologize!” yelled Joshua Wong, the convenor of the Scholarism student group, and one of the faces of the activist movement. “When we were younger were told that police were there to help us, but now it’s the opposite,” Shum said. The night was much shorter than the marathon events held even recently. Anger and hurt at the authorities was clear, but there were fewer present than on previous occasions to share in it. Presence of tents takes up a great deal of space, too, and makes it difficult to tell the true size of the crowd. 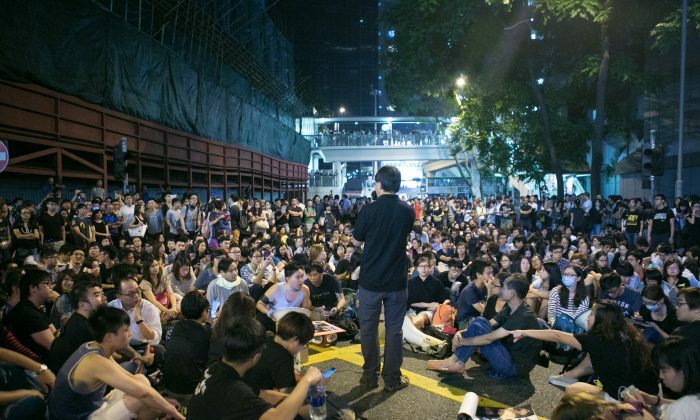 Rather than over 10,000, as was likely present in the days following the use of tear gas on Sept. 28, and then in rallies on the weekend in early October, there were probably only a few thousand on Harcourt Road, the main occupied zone, on Wednesday. Some read novels, others studied charts for work or school, and many swiped their phones, as the speakers each said their piece. Elsewhere on Wednesday, the man whose beating was captured on video, Ken Tsang, made a statement to the press at the North Point Police Station, saying he was “brutally assaulted” while “entirely defenseless.” He intends to sue. Television channels here have repeatedly played the video of Tsang being dragged to a corner of Tamar Park and then kicked and stomped on. The violence evidently did not deter protesters. In the early hours of Thursday morning, 24 hours after they took over and were then driven off Lung Wo road, an important artery, they were again encroaching on the road and forcing police to hold them at bay. “Stop charging or we use force,” said the banners the police held up. On the same day that pro-democracy protesters suffered the worst setback of their movement, they fought back by storming a crucial tunnel.